Bridger Vista Lodge is a luxury log home located in Bridger Canyon northeast of Bozeman, Montana, with a spectacular mountain view of the ski slopes at Bridger Bowl Ski Area. 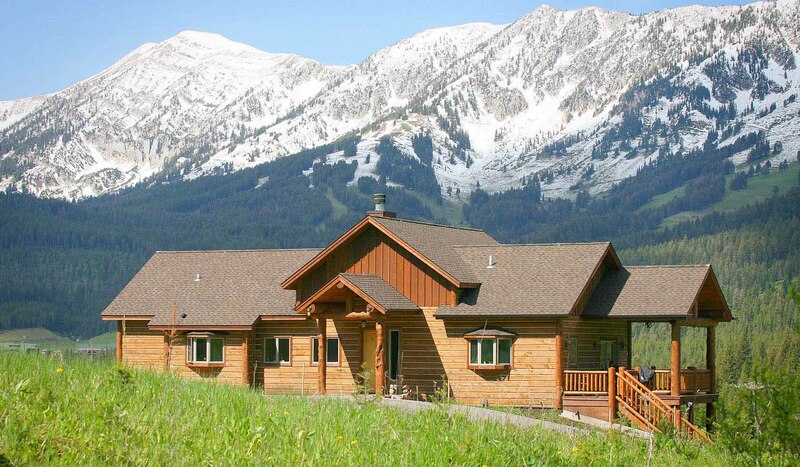 With four bedrooms furnished to accommodate 2 to 10 guests, our Bozeman, Montana, vacation rental is ideal for entertaining, recreation or relaxation in every season. In the perfect location, Bridger Vista Lodge is far enough out of town to be quiet and private but still an easy quick drive to Bozeman. Not only is downhill skiing only minutes away at Bridger Bowl, but you can also cross-country ski in and out of our home to BoHart Nordic Ski Center just across the road. With easy access off Highway 86 and located just 16 miles from Bozeman, this home is the ultimate recreation location to relax and enjoy the mountains in comfort. The main level and master bedroom suite is also wheelchair friendly and we allow well behaved pets with a pet fee. The best feature of our home in addition to location is the spectacular view of the mountains from every room. The great room has a 22-foot vaulted ceiling, a massive Montana moss rock fireplace, rustic maple floors, custom log furniture, native elk horn chandelier and an inspirational view of Bridger Bowl ski area framed in a wall of windows with hand-hewn logs. The vanity bath includes a Victorian slipper bathtub with a champagne bubble massage and a view of the mountains while you bathe. The upstairs master suite has a private deck, log cove lighting, California king log bed, big screen TV, full crib and much more. The lower level has bedrooms have extra long bunk beds custom designed for adults with extra long thick pillow top mattresses, a queen bed with a twin trundle, a queen futon, luxury linens, custom made quilts, laundry room and heated garage. Other amenities include radiant heat for warm floors, a large outdoor hot tub spa, whole house audio with keypad control, two plasma TVs with HD satellite and DVD players, wireless Internet and unlimited long distance telephone service. The hickory kitchen is fully stocked and has a granite island that seats five, granite countertops with stainless steel appliances, including a gourmet gas grill on the deck. Luxury linens and after departure cleaning are included in the rental rate. Loaded with amenities, in an ideal location, Bridger Vista Lodge is the perfect place to enjoy the mountains in comfort.